Hand therapists are leading the charge in terms of functional return of the upper extremity. When it comes to hand therapists, who better than OTs to evaluate, treat, and train clients with upper extremity injuries? In the bustling field of orthopedics, occupational therapists are claiming their rightful niche. If we are looking at our clients through their lens and how they use their hands every day (blended with how they need to maneuver their body), we are able to achieve our unique role in occupation-based care. As OT’s we put the occupation in occupational therapy. The simplest tasks, from brewing a cup of coffee to manipulating car keys, can easily be interrupted. Every OT possess the skills to assess and plan for an optimal return to the client's needs. 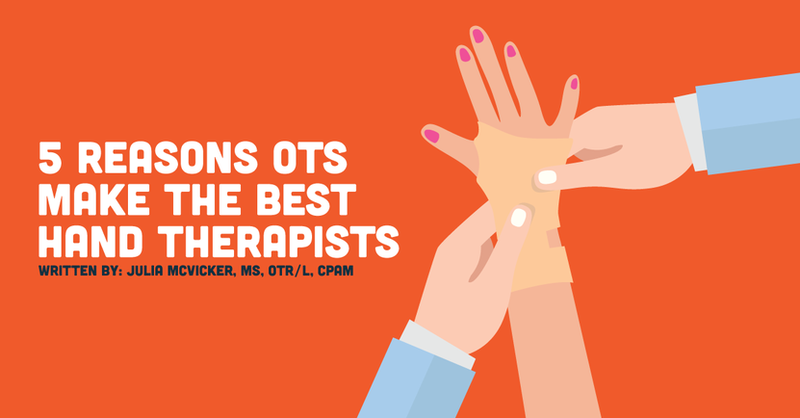 With our unique skills, OTs are positioned to care for hand therapy patients and we are stepping up in a big way. We are highly skilled at wound care and post-surgical scar management. When a client receives hand therapy it often involves wound care or suture removal from a hand therapist. The education and training the client and their family require on healing structures and skin care/scar care can be crucial for the long-term use of their extremity. Imagine your skin is attempting to move and slide over the underneath anatomy but the scar is tethered down and pulls the skin tightly down. Without extensive work on a scar to break up adhesions or prevent their formation, you can lose the ability to move and flex bony joints because of skin tightness. OTs are creative when it comes to positioning joints for functional use and in positions of rest during the early (acute) stages of healing. For anyone familiar with the term orthotics, you know that they are usually rigid structures that either inhibit or promote movements of specific joints. While many of the structural materials are the same, usually no two splints/orthotics look identical. They are custom works of art, and it usually requires years of training by a therapist to master fabrication. A great orthosis will support the joints that it is meant to without creating stiffness or limiting movement in other surrounding structures. It is important to know the entire anatomy of the shoulder, elbow, wrist, and hand to expertly fabricate a splint. That—and lots and lots of practice! The goal of OT is to return clients to premorbid occupations. OTs understand the function and use of the upper extremity within a person’s everyday activities. When a child receives hand therapy for weakness or poor positioning of the hand., an OT may use an orthosis and follow up with rehearsal, education and specific exercises to address the root cause of the disorder and help the child master the occupation of being a student by improving fine motor strength and control in the hand. For adults, they may require therapy to address a frozen shoulder or rehabilitation after a stroke that has left them with limited shoulder motion. An independent adult may now require assistance with self-care such as dressing and hygiene in the bathroom. When an individual seeks out help from hand therapists, OTs can give them an assessment to look at all aspects of their function in their daily lives and in the community. OTs are trained in behavioral science and mental health. One of the hallmarks of OT since the creation of the profession is the central focus on the client's physical and emotional wellbeing. While embracing the occupations our clients participate in, we are acutely aware of the struggles and challenges they face. This awareness leads to a deep empathy for our clients. Our focus on returning a client to independence in everyday activities helps us provide them with personal dignity. Our clients feel empowered by their gained independence and therefore more engaged in the process of healing. Many clients who have been through an orthopedic or neurologic trauma need to address the “whole body” approach to healing. Therefore, they need more support and guidance than standard orthopedic recovery care. OTs are trained experts in the anatomy of the upper extremity. It begins in school with gross anatomy classwork and education on muscle and nerve pathways. As we gain knowledge of the anatomy and purpose of specific nerve and muscle groups, student hand therapists perform Fieldwork with practicing OTs. During Fieldwork, OT students are able to apply that knowledge to specific patients and build upon classroom training. By spending so much of our education focused on what our upper extremities do, we are able to best assess when the client cannot perform an activity and what the limiting factors are.